The discrete elegance of a geisha, lacquer lips, tower hairdressing, porcelain skin. 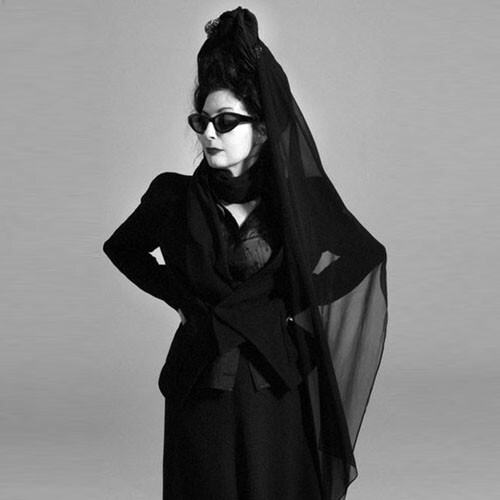 This is Diane Pernet. She is the black figure that, over the last years, has been populating the most interesting front rows. A photographer, a fashion designer, a diva, a journalist, an über blogger. Basically, an absolute genius. Born in Washington and, after graduating from Film School, she moves to New York, where she starts working as a reportage photographer. One day her boyfriend at the time looks at her and says “Why don’t you make something obvious, like design?” Listening to him, she enrolls at the Parsons School and later on at the F.I.T. to study fashion design, but after nine months, she abandons the studies to open her own fashion label. The garments she designs are minimal and severe, in distinct contrast with the decadent movement of the Warhol Factory and the shiny disco period. It is 1990, New York is not ablaze anymore, crime is arising, AIDS deaths are multiplying and Diane’s inspiration has vanished. It’s time to start a new life in the ville lumiere, “In New York people can be themselves and no one cares, but Paris judges you constantly”. Here she is the costume designer for Amos Gitai, the assistant to the producer of the CBC program Fashion files and editor for Joyce mag. Tired of the fashion pollution, of the worn-out, already seen, fashion world, in 2005 she founds the blog A Shade View on Fashion. ASWOF is a window to the world and to her emerging talents in fashion, film, design and architecture. Her refined blogging and her international vision of style dropped the thin veil that separated the fashion elite of the mass, implementing a revolution like Bauhaus: bring back to life the popular art to the people. From her blog Diane says “I just wanted to write about whatever interested me whenever it interested me”, but very soon that became her ticket to enter through the front doors of the fashion journalism Olympus. From a very a young age she is fascinated by the movies, reason why in 2008 she gives life to the festival A Shaded View on Fashion Film. She loves the cinema from Visconti, Pasolini, Fellini, Buñuel, Cassavetes, but three are the feminine figures from which she gets her inspirations from: Anna Magnani in “La Rosa Tatuata”, Simone Signoret in “Les Diabolique” and Dorothy McGowan in “Qui etes-vous, Polly Maggoo?” Young widows exert the same fascination over her, or at least until the romantic image she has dissolves entirely when her first husband, Norman, dies in a car accident. Diane is 31 years old. The day they got married both were wearing jeans, that she wore together with a dark green shirt and a fur jacket; but when he dies her heart stops and her figure is crystallized in a total black cloud: from that day on she will only wear black. “I wanted to fade into my designs and black became my only palette” – she says – “By dressing in a uniform you do not compete with what you create (…) It evolves with time but basically has become my signature.” This signature of her is composed by several pieces. 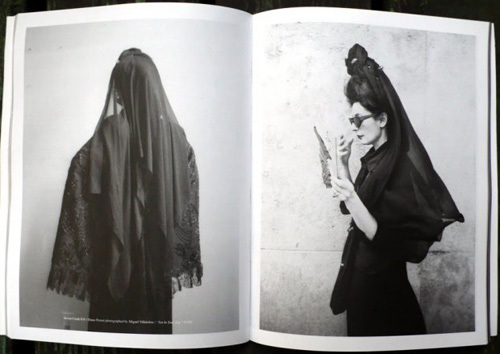 First of all there’s the inevitable mantilla, the veil of Hispanic tradition that covers her head. The first time she wears it is to follow the custom of entering church with the head covered, now is her friend Filep Motwary to design it for her. Under all that chiffon dominates a Pompadour hairstyle, result of an evolution started in the 80’s. Faithful to the ideal “Dress to please yourself”, she does not wear pants, but only dresses and maxi skirts, preferably from Boudicca or Isabel Toledo. As finishing a painting, that seems like a modern transposition of the “Duchess of Alba”, painted by Goya or even more contemporary “The meta bride” from Izhar Patkin, there are the feline frames from Alain Mikili. The extreme classy touch, the Comme des Garçons perfume Incense series and a sunshade of oriental taste, just in case there’s a sunny day. Diane has new and personal sobriety almost pictorial. 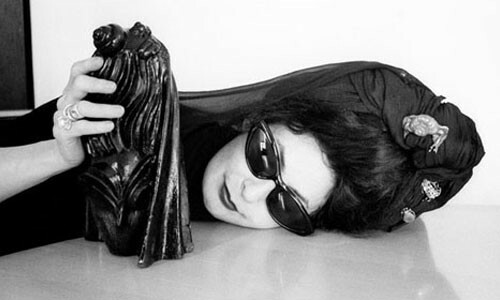 She is a figure that can easily superimpose to certain feminine images of the neorealist Italian movies, to the black and white photos of the Sicilian widows, a gothic Maria Antonietta, an obscure Madonna like the one portrayed by Miguel Villalobos and Graham Tabor. In her house there are two closets, both full of black dresses, exception made only by a blue bathrobe and a red kimono. On her fridge meat is missing, but never her Volvic water. “Integrity, generosity and honesty” is her mantra. “Heroes” is the song she would choose to describe her life and Madame Grès is the person who she would have wanted to meet. Blackberry addicted, Diane is always traveling, a nomad looking for the new talent to be discovered. Many are those whom she has given voice to and that she, with her style vision, has inspired. The long veil that frames the volt of the blogger wraps the new gothic art of Terence Kohn, master in mixing new technologies and the most traditional media, famous for his extreme work. 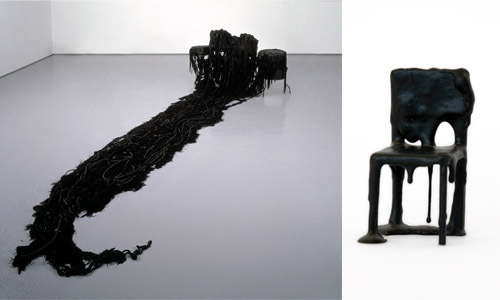 Mrs. Pernet leaves traces in the interior design of the Dutch Pepe Heykoop, with his research on alternative materials, just like she leaves them on the Dark Cube of the architect Soichiro Kanbayashi and on the games of shadow and light of Olafud Eliasson or the web settings of Chiharu Shiota. Diane possesses a cinematic beauty. She is marked by her similarity to Anjelica Huston and it is even too easy to notice the two ladies resemblance to Morticia Addams, interpreted by the actress. And of course, the journalist would be perfect in an Almodovar movie, maybe close to her friend Rossy de Palma and the singer Martirio. 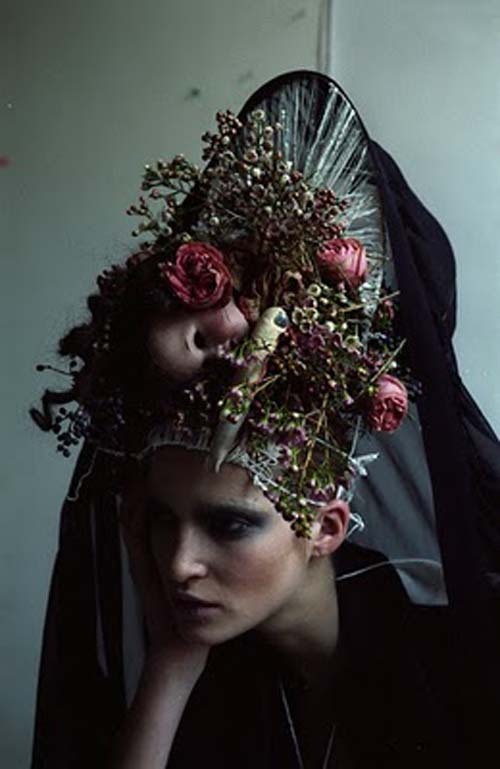 Like an animation from the Quay Brothers, immersed in surreal atmospheres, in between a fairy tale and a nightmare, she has an almost freighting and cryptic appeal. “Style is something that you are born with – she tends to say – fashion is something that you buy”. 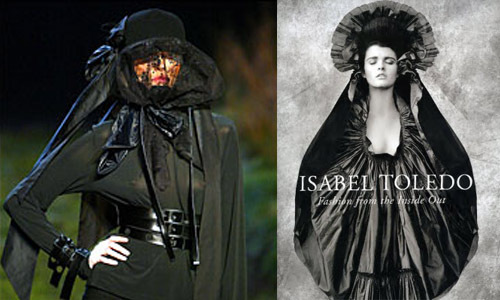 Her minimal baroque is tied to the Japanese designers with a reciprocal love. 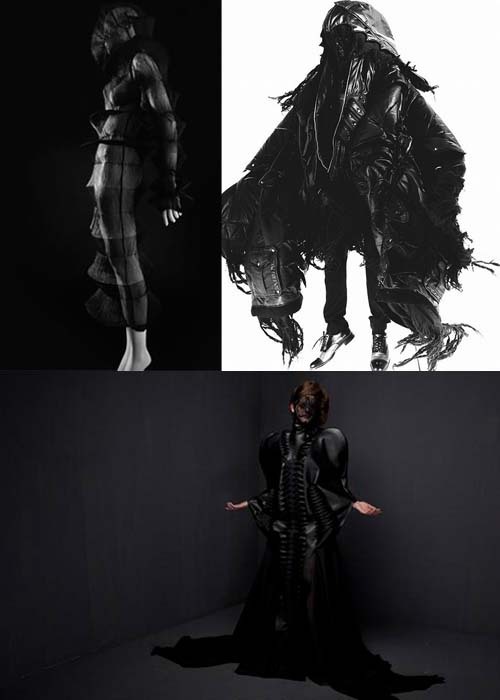 With them, in particular with experimental stylist Takashi Nisiyama and with the sculpture creator Issey Miyake, she shares a predilection for the design of subtle richness, of sober quality and love for the total black. 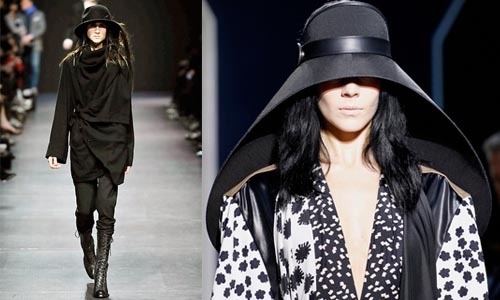 The color black became also a trademark for Rick Owens, Gareth Pugh and Ann Demeulemeester. All of them contribute to create an up-to-date lady, refined and provided with an ancestral strength, the same that animates Diane and that allows her to be an attentive talent scout, priestess of that pagan cult that the online fashion has become. Warriors defending the Pernet style are the women sheathed in the armor dresses of Peter Movrin, while Nicolas Ghesquière, for the 2012 summer season of Balenciaga creates a natural evolution. A black hood in the shape of an egg covers the head and seals part of the face, on the garments the color black is substituted with more vibrant colors, like silver and orange and the shapes become structured. 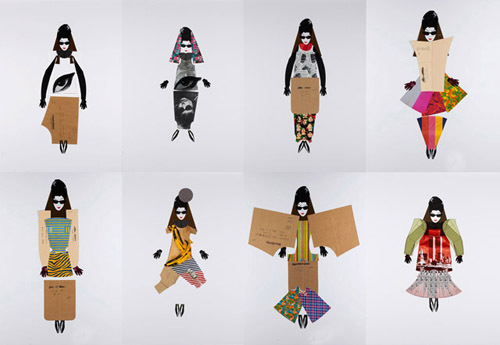 Madame Pernet has become such a style icon to deserve a series of caricature illustrations, made by Hormazd Narielwalla, in which the blogger is transformed into a sort of a Barbie of the multicolor changeable clothes. A woman that has known how to reinvent herself continuously, while remaining faithful to herself and to an image carved in time, that has became her signature. She has foreseen the power of the web and has found a better way to use this mean, giving voice to whomever had a talent that enriched the art world, becoming an international reference point both for bloggers or those who made of fashion their own profession or their own passion. 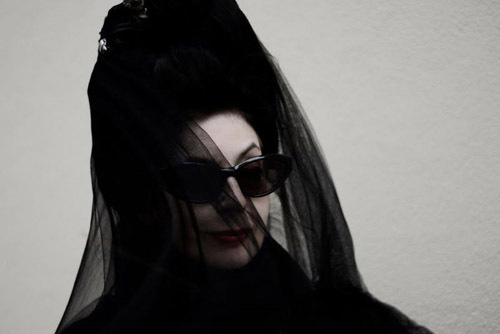 Diane Pernet is a woman truly individualist, truly pioneer, truly talented, truly identifiable, truly iconic, and truly cool.